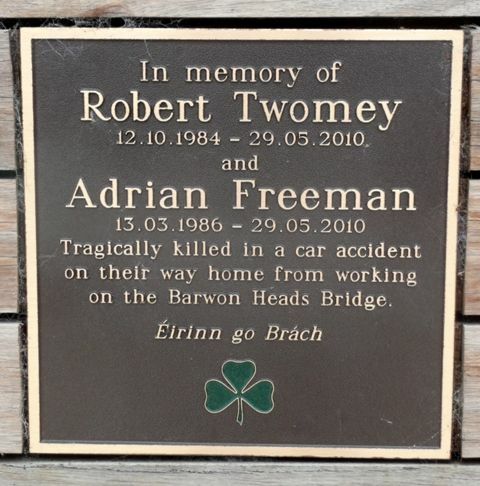 A plaque commemorates Robert Twomey and Adrian Freeman who were killed in a car accident in May 2010 while returning home from working on the Barwon Heads Bridge. Two young Irish friends – one of whom was an inter-county GAA star – have been killed in a tragic road accident in southern Victoria. Former Mayo senior hurling star Adrian Freeman, 23, from Tooreen, just outside Ballyhaunis, and Robert Twomey, understood to be in his mid-20s and from Ballahadigue, Listowel, Co Kerry, were killed instantly at around 2.40pm on Saturday, May 29, when they were involved in a two-car crash at Connewarre, near Geelong. Two other Irish nationals – also in their 20s and in the car at the time of the accident – escaped with minor injuries and were released from Geelong Hospital soon after. Victorian Police believe a Volvo travelling towards Barwon Heads crossed over to the wrong side of the road and collided with the Toyota Camry in which the young Irish nationals were travelling. Mr Twomey was a carpenter and had been living in Australia for two years, while Mr Freeman had only been here since October and was due to return home in August. Freeman, who qualified as a civil engineer from Limerick IT just last year, was a talented hurler with his club Tooreen, at inter-county grade with Mayo, and at inter-provincial level with Connacht, who he represented in 2009 in Abu Dhabi. The Victorian GAA League finals, due to be held last Sunday at Gaelic Park, were postponed in respect. Meanwhile, special memorial Masses will be held tonight in both Melbourne and Sydney. Members of the Sinn Féin GAA club in Melbourne have arranged a special mass for 7.30pm at Sacred Heart Church on Grey St in St Kilda. While in Sydney, Central Coast GAA Club, for whom Freeman hurled during his time in NSW, will host a Mass at St Patrick’s Church in Bondi from 7pm tonight. Irish Echo, 1 June 2010. Tragically killed in a car accident on their way home from working on the Barwon Heads Bridge.